Explore the largest glacier in the Juneau Icefield by helicopter, by airboat, and on foot with one of the best Alaska helicopter tours! The Taku Glacier Adventure features an exciting airboat ride along the Taku River and right up to the face of the glacier. 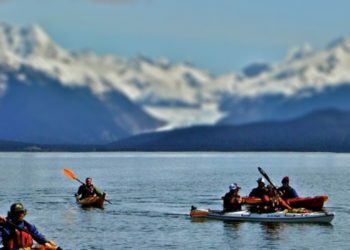 Perhaps even more exciting, this adventure, one of the best Juneau helicopter tours, also includes a chance to explore the glacier on foot, as well as the thrill of flying in a helicopter over the stunning Juneau Icefield and snow-capped Coast Range. 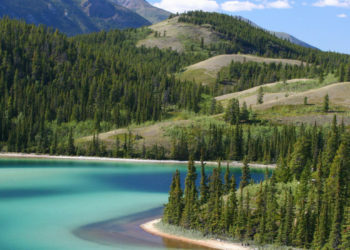 Why visit the Taku Glacier, in particular, out of some 140 glaciers in the Icefield? It’s the deepest and thickest alpine temperate glacier known, is some 36 miles long, and is the only glacier in the Juneau Icefield that is advancing rather than retreating. 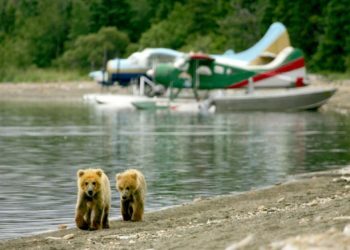 Plus Alaska helicopter tours are without doubt the best way to experience this remote and beautiful icy landscape. Once on-board your helicopter, any first-time nerves quickly give way to wonder as you soar above some of the most spectacular terrain in the world. 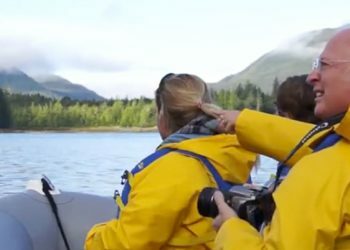 After landing at the Taku tour base, you’ll climb aboard an airboat and zip along the Taku River as your experienced guide navigates the boat up close to the face of Taku Glacier, which is advancing at up to 100 feet per year. Back at the tour base, you’ll have the chance to walk on the advancing level of the glacier itself, where you’ll see crevasses, moulins (deep shafts), eerie crystal-blue ice, and ice falls before another breathtaking flight back to the helicopter base. Without doubt one of the best Juneau helicopter tours, your adventure begins with pick-up at the cruise docks in Juneau, followed by a short drive to the heli-base. 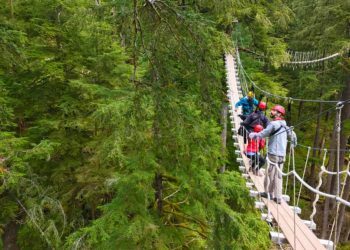 Here, you’ll meet your pilot-guide and receive a safety orientation before lift-off and your thrilling ride over temperate forests followed by glaciers, deep crevasses, and towering snow-capped peaks. 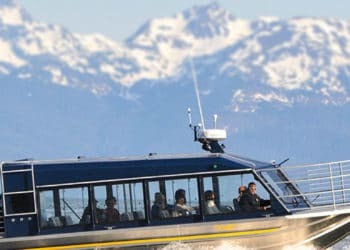 On arrival at the Taku tour base, you’ll be fitted with a full-body waterproof suit and greeted by your experienced riverboat captain before your exciting airboat ride right up to the face of the Taku Glacier. Back at the tour base, a short helicopter flight will land you on the advancing level of the glacier for an informative walkabout and the opportunity for some incredible photographs and video footage of the icy wonderland around you. After another extraordinary flight back to the heli-base, you too will be of the firm opinion that Alaska helicopter tours are the best! The best Juneau helicopter tours, including the Taku Glacier Adventure, are in high demand, so be sure to book early. For another in-depth helicopter experience, consider the Helicopter & Dogsled Glacier Excursion with Extra Landing. There is no child rate for this tour. All participants will be charged at the adult rate. The minimum age to participate on this tour is 7 years. To ensure the comfort of all travelers, passengers weighing weighing 250 pounds (clothed weight) or more must pay an additional $150.00 to secure extra space in the aircraft., Passenger names and weights are required by the FAA for weight and balance calculations and flight manifesting. There is a no bag policy in the aircraft, if you have medical needs that require a carry on, please contact us. All bags brought to base will be stored in the tour office until you return from your flight. Answer: There are several helicopters available at the base, and we can make accommodations for larger groups with advance notice. If your group exceeds 6 passengers and requires the use of multiple aircraft, we instruct the pilots to coordinate landing locations on the glacier so that you can have your landing time together. Will the pilot get out with us? Answer: Definitely. Your pilot will act as your guide for your entire helicopter tour, including the time you’ll spend on the glacier. This allows for a truly focused tour experience. Answer: Absolutely! We are more than happy to accommodate children of all ages and there are several car seats available for customers to use. Answer: Your pilot will be with you the entire tour, so they’ll be happy to lend a helping hand whenever necessary. If you require extra assistance, don’t hesitate to contact us ahead of your tour and discuss your particular needs.